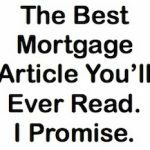 2 Where to Get a Mortgage? 4 What’s Your Interest Rate? 15 What Does The Federal Reserve Have To Do With Mortgages? 16 Who the Hell are Fannie Mae and Freddie Mac? 25 What Mortgage Should You Get At A Certain Age? 27 Reverse Mortgage – Should You Get One? 32 Why Was My Mortgage Sold to Another Company?